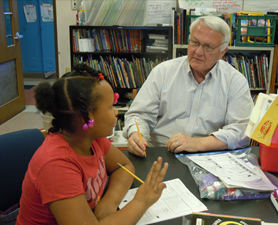 Study Connection is an after-school tutoring program of Fort Wayne Community Schools. Individuals are matched one-to-one with students who have been identified by their teachers as needing extra academic assistance. Pairs meet for one hour once a week during the school year. More than 85% of participating students are bused to and from local businesses and churches where they meet their volunteers for study time. At the end of the hour, a bus returns to take the students home. The program was founded in 1989 by former CEO and President of Do it Best, Don Wolf. The program was piloted for three years in the FWCS District at the end of which time it became institutionalized. Study Connection has garnered national acclaim as a highly successful education/business partnership. Help instill in a child the confidence and self-esteem that lasts a lifetime, and write a new chapter in the remarkable on-going story of Study Connection. Contact Us to learn how you and your business/church can become a study site.